This topic describes how to deploy service mesh for Pivotal Application Service (PAS). For more information about service mesh, see Service Mesh (Beta). Navigate to the Networking - Service Mesh pane of the PAS tile. Under Service Mesh (Beta), select Enable. vSphere: Enter static IPs for the Istio Routers. 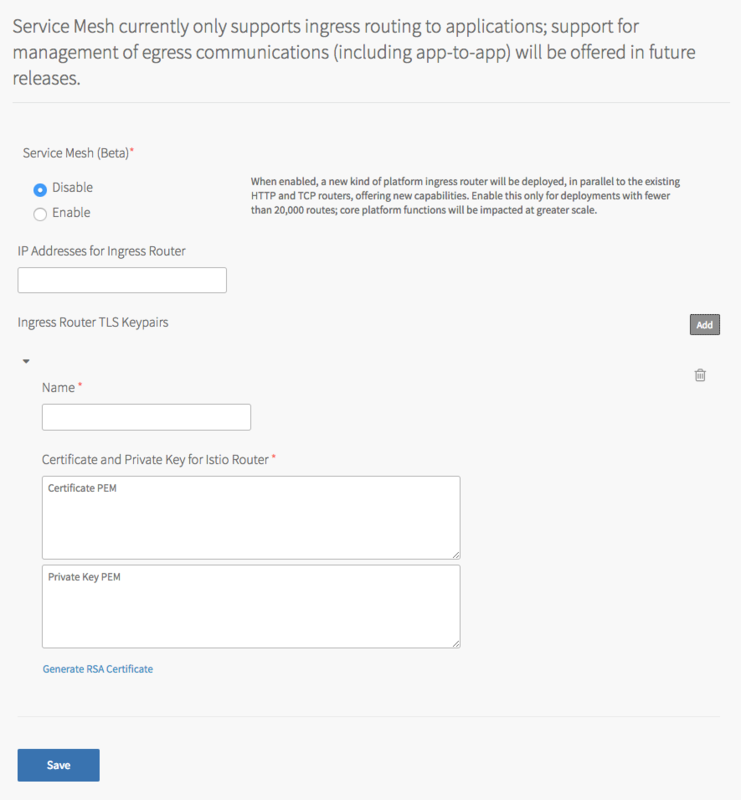 You must configure your load balancer with these IPs as well. Other: Leave this field blank. For Ingress Router TLS Keypairs, complete the following fields. You can add more than one keypair if desired using the Add button. Name: Enter a name for the keypair. Certificate and Private Key for Istio Router: Enter the Private key and certificate for TLS handshakes with clients. These must be in PEM block format. To configure a load balancer for service mesh, do the following. The exact procedure varies by IaaS. Navigate to your DNS provider and create a DNS name, *.mesh.YOUR-CF-APPS-DOMAIN, that resolves to the IP of the load balancer. This is the default domain for service mesh and it is not configurable. Navigate to the Resource Config pane of the PAS tile. In the Load Balancer column of the istio-router row, enter the name of the load balancer you created.